The Nike Sportswear Solarsoft collection seems like a solid solution to the hot weather footwear conundrum. We know you don’t want to think about being practically barefoot when it’s sub-zero outside, but hot weather is, hopefully, just weeks away. Being on holiday is no reason to lower your standards, but barefoot sweat build up, sand and other crisp in your favourite shoes is not the way forward. And Flip-flops? They’re can be a bit sport science student #lad (shouts to the hood dudes in Jordan slides though). Funnily enough the Solarsoft foam material is something we first saw in Nike flip-flops, but they’ve flipped it to combine the ultra light soles with some uppers that take some heavy influence from some cult classics. The Year of the Snake Solarsoft line works the snakeskin idea into some woven uppers and makes any leather detailing scaly for good measure. 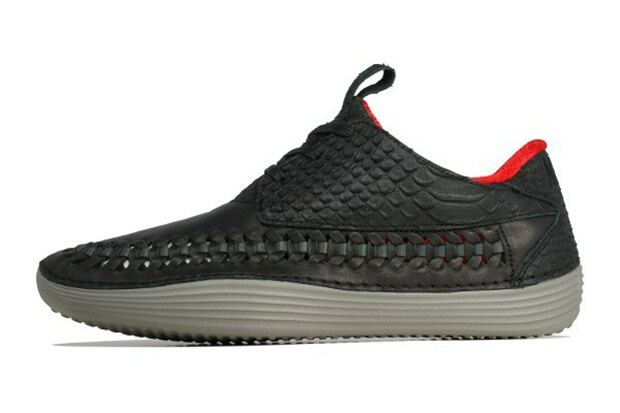 The Nike Solarsoft Moccasin is the most established of the shoes here, with its Roshe Run on-a-dinghy looks, but there’s merit in the Solarsoft Rache Woven too, with that curious strap structure at the rear to make it even more minimal than the usual Woven and a mixture of leather strands that give it extra snake shades.